The New York Times article in the Sunday Review was about issues such as lack of work satisfaction, authenticity, employee engagement, freedom and leadership — things on which Jamie and I have built careers. Of course I was intrigued. And then. And then…. Nothing new or surprising. Not a single revelation, illumination or expansion of the issues that have plagued the modern workplace for at least 30 years appeared in that valuable media real estate. It was a little disheartening. Everything on this list is something that yoga’s philosophy addresses. Not the Westernized version of “Tara Stiles in a glass box” yoga. This is yoga with no mat required, nor is it necessary to touch your toes, do a handstand or work your feet behind your head. 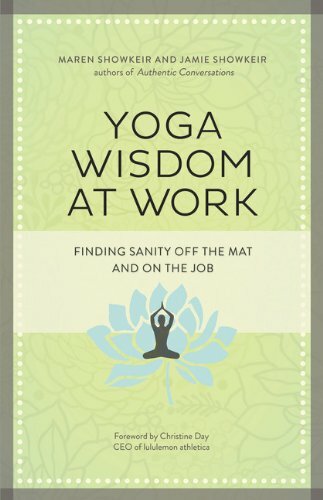 It is ancient wisdom of yoga that offers the modern workplace culture simple, elegant (and free) ways to address all these issues. Practices in meditation, sense withdrawal and non-stealing (of time, energy, etc.) would create time for reflection and creativity. They also help people develop presence and compassion for others. The Sixth Limb, dharana, translates as focus — which is about developing and strengthening the mind’s ability to be fully present in a given moment. Lack of connection to company mission and sense of community could be addressed by non-violence (compassion for others, recognizing human potential); practices in surrender (individual ego is surrendered to the good of the whole, fostering non-attachment); non-stealing (including the time and energy of others); discipline and zeal (ability to hang with the discomfort of change to experience growth) and more. Companies such as Aetna, General Mills and the Huffington Post are incorporating yoga principles into the workplace. Other companies, such as Netflix and Zappo's, have policies that aren't called yoga, but certainly reflect the principles. This wisdom is simple but not simplistic. The practices are pragmatic and easily customized. Why not turn to this time-tested wisdom to create modern workplaces that people can fall in love with? In the end, everyone will reap from the benefits. Once you’ve shared, please send a private message on the Jamie & Maren Showkeir facebook page or email namaste@yogawisdomatwork.com. Put "shared" in the subject line and be sure to include a name and mailing address.